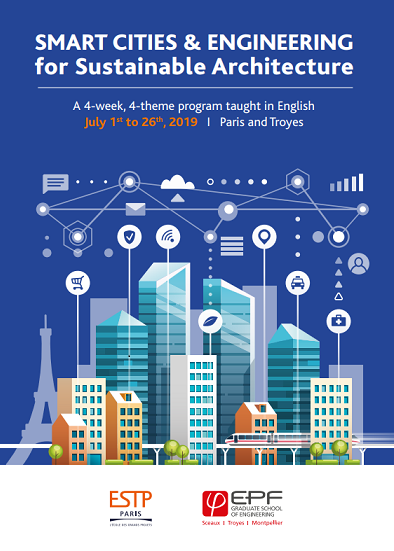 ESTP Paris - EPF Summer Program on Smart Cities & Engineering for Sustainable Architecture offers an in-depth study on topics such as engineering for eco-cities and smart cities, environmental issues, city planning and architecture for the future. Mainly designed for Undergraduate and Master students with a major in Engineering, Architecture, Urban planning/design, Sociology or Computer Sciences. Each module is composed of several workshops and a real case study. Upon success, by the end of each module, students may obtain a certificate and 2 Credits (ECTS). Besides the academic lectures and projects, EPF & ESTP Engineering Summer School organizes a cultural program, which will allow students to discover 2 of the most beautiful areas of France: Paris & the Champagne region. All students will be initiated to the French language in addition to cultural visits, which will contribute to a perfect understanding of the local social and professional environment. ESTP Paris campus is located in Cachan (minutes away from the center of Paris by subway) on a seven hectare green land where teaching and research activities are organized. Students life is energizing since students may benefit from sports facilities, a residence, and a restaurant on the premises. Troyes is a medieval city, just an hour and a half from Paris by train. Troyes is the historic Capital of Champagne, the nearest vineyard is only about ten kilometres. Accommodation in student residences will be organized by EPF and ESTP. Shops and transports will be easy to reach. Living expenses, individual insurances and visa fees are not included. You want to learn more about the Summer School Program, check the replay of the Live video chat below.